A Call to Action for Pima County and Arizona Citizens and Visitors! Unbeknownst to many people who live in Pima County, controversial multinational biotechnology giant Monsanto Co., which is known for bringing environmental and health damage to the areas that grow its genetically modified and pesticide-laden crops, is swiftly taking action to move a chunk of its seed operation into Pima County just northwest of Tucson. 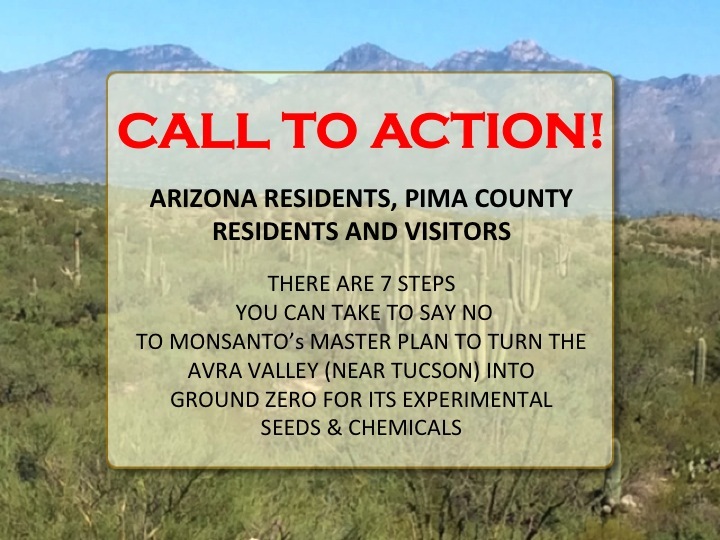 A small but powerful coalition of Pima County and Arizona residents, businesses, and non-profit organizations have already taken action to oppose Monsanto’s efforts, and we call on you to join the “Stop Monsanto in the Tucson Area” action coalition. About two months ago, a front-page article in the Arizona Daily Star by reporter Tony Davis revealed that Monsanto wants to build an enclosed greenhouse to grow corn and soybeans in Pima County and create 40 to 60 jobs. Subsequent articles by Davis disclosed that County Administrator Chuck Huckelberry had been involved in secret negotiations to give a possible tax break to Monsanto for its planned greenhouse for quite some time. The information surfaced through email exchanges between PriceWaterhouseCoopers, representing Monsanto, and the Pima County Joint Technical Education District, a technical-educational program. Martha Dominguez of Rising Tide Tucson, an environmental activist group, which is part of the coalition fighting the tax break, told the Arizona Daily Star: “I want to make sure that the (county) supervisors hear from citizens who feel, number one, that this contract with Monsanto is being done in secrecy. “What is a government official doing signing contracts with private organizations, especially companies like Monsanto?” asked Dominguez. On Sunday, October 16, 2016, the exact same day the International Monsanto Tribunal in The Hague, Netherlands, was wrapping up testimonies by people across the world of harm to health, the environment, and farmers’ livelihood from Monsanto’s agricultural practices, Tucsonans awoke to a new headline that Monsanto bought 155 acres in the Avra Valley. The corporation paid $3.74 million for the land to a company owned by the Kai farming family of Marana. An article in Western Farm Press on October 15, 2016, revealed that in addition to the greenhouse, Monsanto plans to have traditional field operations and select farmers field-testing experimental seeds. Pima County officials call the operation “Project Corn,” and Monsanto has said it will be growing corn and soybeans in its greenhouse and fields and that the seeds and crops will be predominantly non-GMO. (Remember: The corporation is well known for lying about its business.) A Real Estate Daily News article speculates that Monsanto might have plans to experiment with and grow another crop, genetically modified marijuana, there. The proposal to give an incentive deal probably will go to the Board of Supervisors in November or December, Huckelberry has said. And the company has said it plans to start building the greenhouse by the end of 2016. A group of maybe half a dozen people, including me, farmer Anne Loftfield of High Energy Agriculture, and a few members of Rising Tide Tucson, gave our comments on why Pima County should not do any type of business with Monsanto at the Board of Supervisors meeting this past Tuesday, October 18, 2016. I actually gave a copy of my Going Against GMOs book and my guest opinion piece to each of the supervisors and I extended an open invitation for me to answer their questions, give them more information, show The World According to Monsanto documentary, and be involved in public events about this important issue that could have devastating ramifications for the future of Pima County. I will post comments from a few of the people who spoke in an upcoming post. Of the five supervisors on the Pima County Board of Supervisors, Supervisor Richard Elias of District 5, is the only one who has gone on record saying he doesn’t support a tax break for Monsanto. Supervisors Ramon Valadez, Ray Carroll, and Sharon Bronson have not come out yet with a public position on whether they support giving a tax break to Monsanto or not. Just read the Monsanto article in the paper. Well now, another back room deal being negotiated?? People are outraged? It is about time. These deals need to be thoroughly researched and vetted. Let’s see how many days notice we get on this deal before it is served up for a rubber stamp! Disgusting that I am hearing about this in the media as a County administrator does the deal in the dark of night. Disgusting! Pima County taxpayers deserve better! I would like to clarify my position. At this point, I don’t have enough information to be for or against this proposal. We need to have a thorough vetting process and input from the public prior to taking a position. These back room deals under the leadership of Chair Sharon Bronson need to stop. Democrat Brian Bickel, a former Marine who is running against Ally Miller, has told us that he opposes giving a tax break to Monsanto. Kim DeMarco, who is running against Sharon Bronson in District 3, also has told us she is against giving Monsanto a tax break. To save our environment, the food we are blessed to grow here, and our health, it’s time for Pima County and Arizona citizens to band together to form a grassroots full-court press against Monsanto. Tell your friends, family, neighbors, and co-workers about Monsanto wanting to swoop in and take hold in our community. Make sure everyone you know in Arizona and across the country knows what’s going on. Or call the office of one of the supervisors and give them your address so they can tell you who it is. The contact info for all of the supervisors is listed at the end of this article. We need a community-wide effort to bombard the supervisors’ phone lines and their Facebook pages with comments telling them they work for us and we don’t want Monsanto here! Republican Supervisor Carroll, who was called an outspoken environmentalist by the Star, is not running for re-election. Write him and urge him to make his lasting legacy a good one for Pima County’s environment by voting against a tax incentive for Monsanto. Write Supervisor Elias and thank him for saying he won’t support a tax break for Monsanto. To the other three supervisors, write them and ask them to come out with a public statement on whether they support a tax break for Monsanto or not before the election on November 8th. Before you vote, find out how the opponents running against them stand on the issue, then vote for the person who best represents your views. If you live in Arizona but not in Pima County, or if you are a winter visitor or travel often to Pima County, please also call our supervisors and tell them you will no longer travel and spend money here if Monsanto establishes a facility in this area. Stay informed through alternative media including this site. As much as we applaud the excellent reporting of Tony Davis in the Arizona Daily Star, mainstream media often is limited in what it can say. Our group decided it’s very important to run an alternative press, so to speak, with in-depth, citizen-oriented articles like this one that are then spread through social media. Bookmark this blog page and refer to it frequently, or sign up for both my e-newsletter and local news emails at my GMO-Free Information page. Because of how quickly this story is moving and how swiftly actions we’re doing are being planned, we encourage you to like and follow the Facebook pages of Melissa Diane Smith, Going Against GMOs, High Energy Agriculture, GMO Free Arizona, GMO Free Baja Arizona, and March Against Monsanto Tucson to stay the most up to date on news and community events that you can. (Rising Tide Tucson is also actively involved in this “Stop Monsanto in the Tucson Area” movement, but as of right now, it does not plan to post regularly on its Facebook page about this issue.) As the movement grows, more people and partner organizations will join us and can help the cause by sharing the posts through their social media networks. Get involved and join us. Our small core group can’t do everything that needs to be done by ourselves. We need both your assistance spreading information to your email lists and on your Facebook pages and your help working directly with us to plan, organize, and publicize events, research information on the Internet, create memes, hand out flyers, call or offer venues to hold events, and grow our movement to reach out to schools, religious groups, non-profit organizations, and others our core group cannot yet reach. If you know a place where we could show a documentary, such as The World According to Monsanto or Genetic Roulette, or where I could give a presentation to provide people more information about Monsanto’s record, we definitely want to hear from you. If you want to join our group, message Anne Loftfield through her High Energy Agriculture Facebook page or visit her at the High Energy Agriculture booth at the Rillito Farmers Market on Sunday. Or write us at joinus [at] goingagainstgmos [dot] com. When you write us, give us your name, email address, and phone number, and tell us about any special skills you have or ways you’d like to help, as well as any connections you have that may help the cause. Watch for an upcoming community open forum we’re planning before the next Board of Supervisors’ meeting so you can voice your opinions before the board votes on incentives for Monsanto. Get ready to act quickly and come to the event and bring as many people as possible to tell the board we unequivocally don’t want Monsanto in our community! Plan to be at the November 22, 2016 and December 13, 2016 Board of Supervisors’ meetings at 9 a.m. at 130 West Congress Ave. We need as many people there and willing to briefly speak as possible! I went to my first Board of Supervisors meeting this past week and I’ll be honest with you: It’s not a fun experience—driving downtown in rush-hour traffic, finding and paying for parking, going through security (a tip: don’t bring any glass bottles), then filling out a little green card in order to be called to speak, sitting through a lot of other business, and then trying to say what you need to say in under 3 minutes. But those of us who were there at the last meeting are willing to go through some inconvenience and hassle to try to stop this outrageous deal with Monsanto and save the community we love! We hope you feel the same. If you would like to go but don’t know what to say, we can help you. And if you would like to go but don’t want to speak, that’s okay, too. We simply need as many people there as possible standing against giving a tax incentive to Monsanto. Boycott corn, soy, sugar, canola, alfalfa, and cotton. Monsanto makes Roundup Ready genetically modified versions of all of these crops, and collectively we need to avoid buying and eating these foods and foods that contain derivatives of these ingredients to put as much economic pressure on the corporation as possible. (If enough of us stop buying those foods, the company will be forced out of business!) As an added bonus, as I explain in Going Against GMOs, there are positive health benefits that come with avoiding corn, soy, sugar, and canola oil, whether they are genetically modified or not. These are subsidized foods that, generally speaking, don’t promote health. Our coalition feels like we would never be able to live with ourselves if we don’t do everything we can to try to stop Monsanto’s plans in our area. Please join us and help us make this a winning effort to save our land, environment, food, and people.